Peter Pan's archenemy, he is always plotting to get revenge on Peter for his lost hand. A powerful ally of Maleficent and the Heartless, his greatest fear and weakness is the crocodile that constantly stalks him after eating his hand and craving for more. 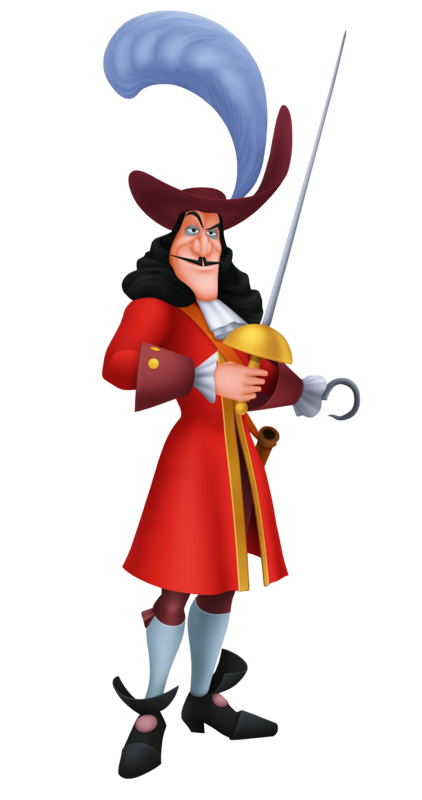 Captain Hook first appeared during a meeting of the different villains that have gained control over the Heartless. He was not pleased by Sora's appearance and the fact that the "King's lackeys" were helping him. Some time later, Riku boarded his ship to take Kairi to Hollow Bastion. Sora and his friends arrive not long after, but they were surrounded and captured. Hook is annoyed by Riku's arrogance, having the gall to order him around, but quickly forgot about it when he thought he heard the all too familiar ticking of a certain crocodile. He was very dismayed to find out that he had gone through all the trouble of capturing Wendy for nothing and asked Riku about Maleficent's plans. Riku did not know or cared; all he wanted was to return Kairi's heart. Hook told him he was wasting his time and staked his remaining hand that the Heartless have devoured it. Mister Smee interrupted their conversation to inform them that the prisoners have escaped. Furious, Hook orders him to bring Wendy to his cabin. After Riku left with Kairi (and without as much as a goodbye, the Captain complained), Hook managed to lock Tinker Bell in a lantern and held her hostage in exchange for the Keyblade. Sora chose to walk the plank instead and tricked the captain. Peter soon returned after taking Wendy to safety earlier, and the timely arrival of the crocodile sent Hook hiding in his cabin, entrusting Mister Smee and the Heartless to take care of the brats. After getting rid of all the Heartless, Peter fooled Captain Hook into coming out of hiding. The Captain was defeated and fell off his ship only to be chased by the crocodile. Captain Hook was a member of the group of Villains that assisted Maleficent in perusing her wicked plans. After this previous endeavor fails, Captain Hook returns to Neverland finding maps on his ship pointing him towards the sites of multiple hidden "treasures". Filled with greed, Captain Hook takes his first mate, Smee, on a quest to retrieve these buried treasures. All chaos ensues as soon as Captain Hook discovers that the treasure chests are empty and it's up to Roxas to clean up the mess! Captain Hook is the captain of the pirates of Neverland. He forever seeks vengeance on Peter Pan who was the cause of his lost hand to the crocodile. Hook loves himself and his treasure and is constantly obsessed with getting revenge on Peter Pan. He's extremely short-tempered, but also extremely cowardice in some cases, particularly when he hears the crocodile that ate his hand approaching. As Terra appears on Neverland he sees Smee and Captain Hook attempting to move a treasure chest, but the two are attacked by Unversed. Terra saves them and Hook manipulates Terra by telling him Peter Pan has been trying to steal his treasure chest which is filled with Light. After Terra agrees to guard his treasure, Captain Hook goes out in search of more treasure, trying to find the shooting star that Smee saw. When Captain Hook arrives on the sight of the shooting star he finds Mickey's star shard and quickly scrapes it up, at the same time, kidnaps Tinker Bell. Ven see this and chases Captain Hook. The two end up fighting but before Ven can finish Hook, Hook is chased away by the Crocodile. During Aqua's search for the Lost Boys' stolen treasure she finds Captain Hook, Hook shortly finds out that the treasure was ‘worthless junk' and abandons the chest when he hears the approaching Crocodile.